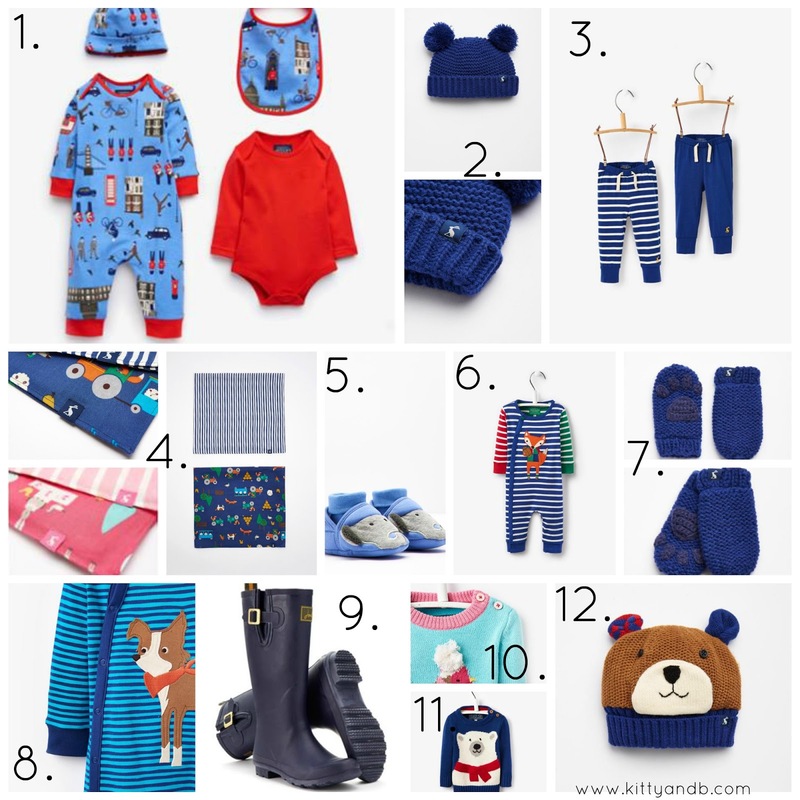 12 Outlet Favourites from Joules. 11 for baby and 1 pretty stylish looking, muddy puddle essential for mummy! Never heard of Joules? They’re a 25 years young British lifestyle brand that sells homeware and clothing for women, men and children – including babies, so that’s where my interest was first piqued! I’m glad I found them. In fact the pic of B on our About Us page features one of my favourite pairs of leggings from a set from Joules. We’ve had them for some time and they still look brand new, just a shame they’re too small now. Sob. Yes, some of it is at the mid to pricier end of the baby clothes scale, but the quality is fantastic. If you want quality over quantity, by being savvy, you can get lots of wear to your pound. And their stuff makes for great hand me downs. I’ve been raiding my Christmas money again I have just picked up a few bits from their outlet. I also bought a couple of things for next winter, like the bear hat and the polar bear jumper. I like to be prepared! There’s loads more on the Joules website, but these are my favourites. Click the links or the pics to go directly to each item. There’s a video on our YouTube channel and below, so you can see what the stuff we bought looks like. Be sure to subscribe for more! There’s currently 25% off EVERYTHING until Sunday 28 October. 1. Baby Boy London set £14.95 from £34.95. I bought this for next Autumn/Winter. 3. Crawlers £9.95. Gutted I missed out on the other sizes! 9. The wellies perfect for jumping in muddy puddles and I hope will be my Hunters affordable dupe. I am a welly kinda gal, but I do like them to look stylish too. I love mine for walking in and I am a Hunter girl as they are comfy and last forever. Mine have taken a real battering over the last 5 years from camping, to festivals to baby sensory and are still going strong – come rain, hail, snow (maybe not so much the summer shine). So, in a controversial departure, I’ve ordered these. £16.95, with a 1 year guarantee – I have them I have high hope for them! Will keep you posted! There are other styles available. 10. Robin Jumper £8.95 from £24.95. One for the girlies. Hope you find some inspiration! Let me know what you get and if you find any steals I’ve missed!